Dr. Yihua Bruce Yu is an Associate professor of Pharmaceutical sciences and Bioengineering at the University of Maryland. Prior to joining the University of Maryland, he was assistant professor at the University of Utah. He received his Ph.D. in molecular biophysics from the Johns Hopkins University and conducted postdoctoral work at the University of Alberta in peptide chemistry. His current research interest includes biomaterials engineering and imaging agent development. He received the 2004 Kimmel Scholars Award for his work on imaging agent development and the 2005 Presidential Early Career Awards for Scientists and Engineers for his work on biomaterials. 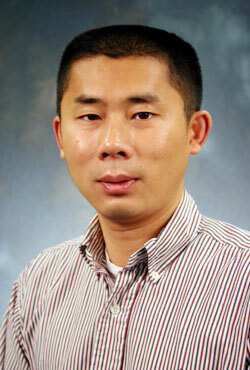 Dr. Bruce Yu's research has two main thrusts: biomaterials engineering and imaging technologies. In the biomaterials area, our current focus is the link between molecular chirality and material mechanical properties, exploiting chirality to create biomaterials with novel mechanical properties for cell growth and differentiation. In the imaging area, we develop imaging agents for multi-color F-19 MRI. He is also working a MRI technology to evaluate the mechanical properties of soft materials and biological tissues.